Jeff Boyer takes bubbles to the max in this one-man bubble extravaganza. It’s the craziest, most creative bubble show around. Jeff juggles bubbles, sculpts and builds with bubbles, makes fog-filled bubbles and more. 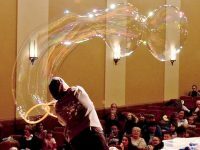 Mixing comedy, music and interactive bubble-magic, he engages and delights audiences of all ages. where the audience participates in the creation of art.